To improve medical treatment, researchers test new drug ingredients on biological cells. By combining two microscopy techniques, the time required for testing can be reduced by 50 to 80 percent. And far fewer measurements are needed. When developing new medications, biologists and pharma- cologists test different active ingredients and chemical compounds. The main purpose is to find out how biological cells react to these substances. To do so, researchers often use a fluorescence microscope that produces digital, holo- graphic images, i.e. computer-generated holograms in which the cells being studied can be viewed in three dimen- sions. The hologram is first created as an optical image, which is then digitized for recording and analysis on the computer. The computer calculates the data needed to display the three-dimensional image of the cells. This method has several advantages. The researchers don't have to use markers to make the cells visible. They can examine the cells without touching them. And the cells can be characterized in vivo – scientists refer to this as in vivo testing. To obtain precise and reliable answers to the question of how the cells react to chemical substances, each cell must be placed in an individual, tiny hollow (well) on a microfluidic chip, i.e. one cell per well. This ensures that the cells are not influenced by the presence of other cells. Another requirement is that the cells must be of the same size, so that their reactions to the active agent can be compared. The problem is that it is difficult to transfer single cells to the tiny wells. Often, the researchers pour them in together with the nutrient solution in which they were grown. This can have two unwanted consequences: firstly that several cells occupy the same well and secondly that the cells are of all different sizes. It can even happen that cells swim out of the wells during the test. The researchers have to take all these factors into account by employing statistical averaging. In other words they have to carry out innumerable measurements and test large numbers of cells in order to obtain a scientifically accurate result – an undertaking that can be extremely tedious and time-consuming. Researchers at the Fraunhofer Institute for Production Technology IPT in Aachen have found a solution to this problem. "It combines digital holographic microscopy with the use of optical tweezers," reveals IPT group manager Stephan Stürwald. Optical tweezers are a special instrument that uses the force of a focused laser beam to trap and move micro- scopic objects. This tool enables the researchers to pick up selected cells, transfer them to individual wells of a microarray, and keep them trapped there. "By combining these two instruments, we can save between 50 and 80 percent of the time normally needed for such work, depending on the type of cell and the test method employed. That's mainly because we don't have to carry out so many repeated measurements," explains Stürwald. The system is very easy to use, and the optical tweezers can also be controlled via the touchscreen of a tablet PC. The combination of these two techniques not only simplifies current test procedures but also allows new tests to be developed. For instance, it is possible to position cells at a defined distance from one another, thus creating different patterns. In this way, the scien- tists will be able to observe cell interactions, because the spacing between them is ident- ical and fixed. One possible application is in the study of apoptosis, or sudden cell death. When a cell dies by apoptosis, it excretes substances that affect the behavior of other cells around it. But within what radius? Researchers will now be able to directly answer this question. 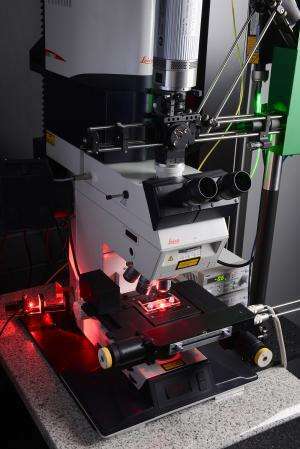 The new system will also enable them to use the laser to selectively destroy cells that that are unsuitable for testing. A prototype of the system has already been built. It con- sists of two modules: the optical tweezers and the digital holographic microscope. The researchers have successfully carried out initial tests using the new system. Can we use 3-D printing and stem cells to build a bone?